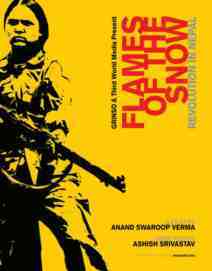 The Indian Censor Board has refused public screening of Flames of the Snow , a documentary on Nepal stating the film elucidates about Maoist movement in Nepal and their ideology. The censors cited the recent Maoist violence in some parts of India, said the producer of the film, Anand Swaroop Verma. The refusal for screening was a matter of surprise as the film does not have any reference at all to the current Maoist movement in India, said Verma, who is regarded an expert on Nepalese affairs. The film highlights struggle of Nepalese against the monarchy, anarchic reign of Ranas and burial of kingship in the year 2008 when Nepal was declared a republic. I am submitting the film to revising committee of the Board, said producer Verma. After refusing the certificate for public screening to a documentary film on Nepal, Flames of the Snow , on the ground that it justifies ideology of the Maoist movement, the Central Board of Film Certification Board (CBFC), has finally given a U/A certificate to the film, produced by a Delhi-based journalist, Anand Swaroop Verma. Verma, who is an expert on Nepal affairs and was a member of team of international observers to monitor all elections in the country in recent past, told the news agency that the revising committee members of the Board along with chief censor Sharmila Tagore watched the film last week, talked to him on its content and asked to give a disclaimer to clear the film. Quoting a letter from Delhi regional office of the CBFC, Verma said the disclaimer now said, The substance of the documentary has been compiled from various media publications and views expressed are of the individuals interviewed. It is not the intention of this documentary to offend the sensibilities/sentiments of any country or individual . The SBFC had earlier refused to give certification to it by saying The 125 minute long , Flames of the Snow , tells about the Maoist movement in Nepal and justifies its ideology and keeping in view the recent Maoist violence in some parts of the country, the permission of its public screening can not be given'.